The Norwegians are one of the few reasons for me to visit the Grüne Woche, as their presentation is clearly based on quality. These friendly Nordic men and women all sport the loveliest redbluewhite starred knitted pullovers and they have aquavit (of course), a lot of fish as well as rendeer and elk meat on offer. 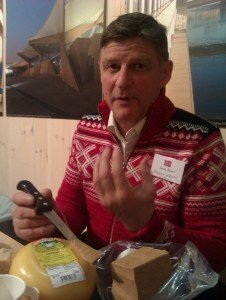 However what excited me most this time was the goat cheese (of course) Svein Håpnes showed me. Svein lives in Limingen, in a region Norwegians think of as central: about 550 Kilometer north of Oslo as the crow flies, which translates into an eleven hours drive, not far from the Swedish border and the Børgefjell national park. He is in his mid-fifties and he doesn’t live that central on his own but shares his farm with a goat herd who roam freely in the mountains and show up by themselves twice a day to be milked. Svein took over Skånaliseter in 1981, as the fourth generation. It all started when his great grandmother bought a pregnant goat in 1900. His grandmother upgraded to about fifteen goats (and a few cows to make butter), but had only enough milk for cheese during the summer season, from May till September. This led to the tradition of the coffee cheese, a complete surprise to me. 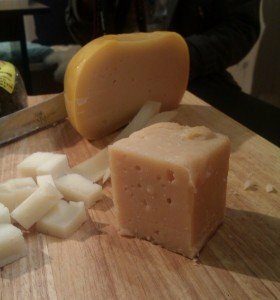 The semihard cheese as such had nothing unusual, it was more or less based on Gouda. 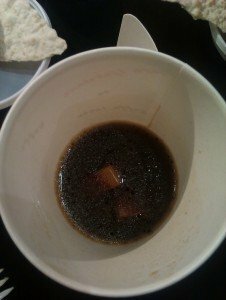 Cut in half-inch cubes and served in hot black coffee though? That I had never encountered before. But it was really tasty, and made a lot of sense when you think about the remoteness of that region; a very sensible way to preserve the summer’s fresh milk for the long winter (however Svein told me that they are eating dried meat this way as well – coffee as a soup, why not?). But he had much more to offer. Next came a 10 (ten!) year old hard goat cheese. I swear, against all odds and accumulated experience, the Dærga did not taste sharp, too strong, dry or in any other way negatively mature. It ripens in the mountain air and Svein said after a year the rind was so dry that he didn’t need to treat it at all to keep unwanted bacteria and mites at bay. Sensational. I didn’t ask how much he sells it though, because ten years plus small scale artisanal production combined with the Norwegian price structure… But that didn’t diminish my excitement. He then showed me a new cheese created for the national parc’s 50th anniversary in 2013. The round fresh cheese had some penicillium cultures added, was coated in ash and been matured for almost half a year. It tasted younger in a good way, at the same time mild and intense. „I wanted to make a cheese,“ my new cheese friend explained, „that would look like a rock in the mountains, with the four colours of that landscape, black, green, blue, and white.“ Indeed. In my mind I was already busy planning my next Norway trip… Svein told me he travelled a lot during the winter to gather new ideas and impressions and I liked this openness, because it was obviously balanced by a quiet awareness of where home was. Home for a Norwegian always includes Brunost, brown cheese, although cheese is too narrow a category in this case. 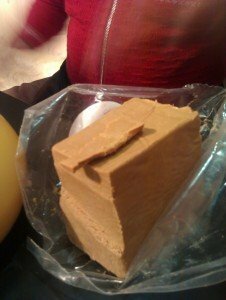 It is also dessert, sweet, nougat… Brunost, also called Geitost, is made by boiling down the whey. 400 liter whey result in 35kg light brown coloured caramellised concentrate, potentially addictive. Svein said that he adds 100 liter fresh goats milk when the whey is starting to caramellise, possibly the secret behind the superfine quality of his stuff. At that point I knew for sure that I just HAD to return to Norway. Heia Norge!